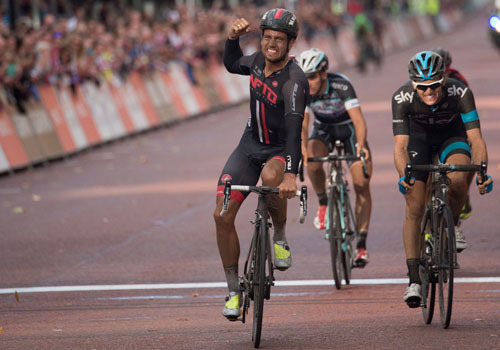 Adam Blythe insists outsprinting fellow Brit Ben Swift to take victory in Sunday’s Prudential RideLondon-Surrey Classic proves he can mix it with the very best. Blythe moved from BMC Racing to new British team NFTO Pro Cycling at the start of the season, in doing so taking a step down from world tour level races such as the Tour de France. But with his team one of 25 in action at this weekend’s 200km Prudential RideLondon-Surrey Classic, the Sheffield rider was more than a match against some of the world’s best riders. At the front for the whole of the rain-soaked race, Blythe was part of five-man break alongside Swift with 20km remaining. And with the two in pole position to contest the final sprint heading into The Mall, it was Blythe who held his nerve to cross the line first, with the 24-year-old admitting he was determined to have no regrets. “It was a difficult day out there, it was a race you had to be at the front of all day to be in with a chance,” said Blythe, who was joined on the podium by Frenchman Julian Alaphilippe in third. “I just wanted to make sure I didn’t regret anything with the sprint starting late so I just wanted to go early and make sure I got everything out. “It’s hard to put into words what it really means. I think the emotion on my face says it all. Swift’s second place made it not only a British one-two but also a Yorkshire double on the podium. The pair grew up just ten miles apart and Swift – who believes the victory bodes well for next month’s World Road Championships in Spain – was happy to see his close friend making the headlines. “I knew it was going to be between me and Adam at the end, I’ve known him since I was six years old,” he said. “We have raced abroad together and have been best mates ever since. I knew that he was potentially the quickest one there and I just wanted to keep and eye on him and not let anyone get away really but he just got me at the end. “It’s brilliant to get a one-two with him, I haven’t race with him for a while now because he took a step down out of the world tour. “I’m really happy to be up there and contesting. Normally I just sit in the team and the team rides, I think it shows the condition is coming now.